I live just beyond the city limit of Gladstone Oregon. Gladstone is one of many small cities that surround metropolitan Portland Oregon and though we are not residents of Gladstone we are served by its post office and therefor have a Gladstone address. All of my work as a plumber over the first three decades was in and around the city of Portland Oregon. In the coarse of that period I began to work on older fixtures so as to keep my work interesting. Now I am almost entirely engaged in what has become my specialty, the restoration of vintage plumbing fixtures. There are plenty of fine old homes here and many of them still have original fixtures. Year by year the nature of my work has migrated toward repairing and installing vintage fixtures. For me that means 1965 and earlier, for the most part. The creation of Plumbing-geek.com in 2010 changed my work again. As the website grew I began to include my vintage restoration portfolio. There was no great impact at first but for the last several years I have answered hundreds of questions and worked on scores of fixtures. With the exception of the projects I will actually travel to, a range of about one hundred miles, all of these fixtures have been shipped to me and were shipped back when done. Shipping is like anything else, there is a lot to know if you want to do it right and doing it right is how you get a good result. I have seen some mixed results and a few disasters, mostly with incoming packages. I have reached the point of getting a consistently good result on outgoing product delivery. At the same time I am increasingly frustrated by disasters and near disasters on incoming shipments. To address this I thought I would take the time to write this blog post in the hope that a few pointers would alleviate the bulk of this frustration. I guess the first thing to say is an admonishment. The older and the rarer a thing is the more likely it is to be made of a substance that might best be called "unobtanium". If you have one, and it is near impossible or really costly to replace, handle it carefully and thoughtfully. Being thoughtful myself, one of the first things I did when I was faced with putting a finished fixture that wasn't mine and couldn't be replaced into the hands of a shipping company employee was worry. The second thing I did was insure it. I would like to say that I studied the whole shipping insurance deal but at first I didn't. I like what I do and I talk about it. I especially talk about it with the people I hand these packages to, perhaps thinking that they might respect the shipment if they know how rare the contents are. Early on one fine person told me my package could not be insured for its full declared value. There are limits to what may be insured and how much value may be declared. What this means is that the fine print of the insurance agreement exempts the shipping company from being liable for certain types of loss. Antiques in particular may be problematic to file a claim on. It is not at all uncommon for me to ship packages with actual values exceeding $5000. Because of the nature of the contents, being rare antiques, plus the value of some packages, I was unable to satisfactorily insure with any shipper. Faced with this insurance dilemma I did go into the fine print of the various shipper's agreements and found no clear path. I suggest that you read the fine print of the agreement with your shipper and perhaps speak with a knowledgeable representative before you go blithely forward. In the end I treated the issue the way a contractor does. I contacted my business liability insurance agent and had a frank discussion with him. He was happy to write a rider on my general liability policy and we revisit the topic annually to keep it at an appropriate level. I am now able to say that I separately insure my outgoing product. Unfortunately I am unable to insure incoming product. If you are unsatisfied with your shipment coverage you might speak with your agent to see if he or she can offer a solution. That worked well for me. Typically a cardboard box makes a good shipping container. Cardboard boxes though are not all equal. There are various types and weights of cardboard and boxes may be rated for strength and rigidity. 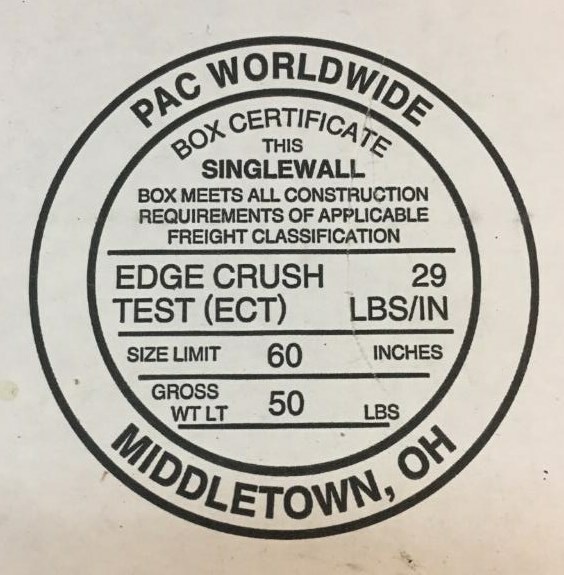 Many boxes are marked on the bottom with the details of their maximum rating. Try not to use boxes with tears, scuffs, or crushed corners. Seal your box by using broad plastic or fiberglass tape, not duct tape. Seal the edges of the flaps, top and bottom, and reinforce the original center tape on the bottom of the box. Many times the bottom of a used box may have accumulated dust so wipe the bottom before you tape it and make sure your tape holds firmly in place. 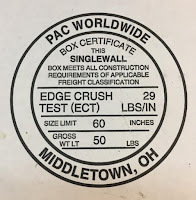 If you plan to let a shipping company label your shipping container they will probably get the required information from you when they generate the label. If you will address the box yourself mark it just as you would an envelope. In either case, place the information on the top of the box. Here are a few tips. If you write your destination address and return address on a sheet of white paper it will be more legible. Tape that sheet of paper to the box covering it completely with clear tape to keep it from being soaked, torn, or soiled. If you write directly onto the cardboard tape that as well. If you selected box was originally used to carry alcohol or a flammable liquid, and is so marked, you may have to wrap the entire box in paper to legally ship it through the mail. Older shipping labels should be obscured with black marker. 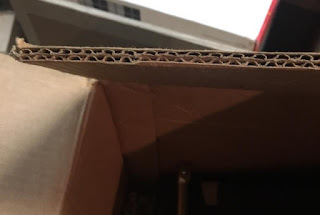 Do not try to remove them as they often take the outer skin of the cardboard with them, compromising the integrity of the box. Prepare a page or two to go inside of the box before you seal it. This page should begin with the same information you marked the box with to insure delivery of a badly damaged container. Next should be your contact information, preferred phone and email. Lastly, give instructions and perimeters of the expected work. This last is helpful for me as I speak with so many people during any given week. I often get printouts of emails I sent or received, that can be helpful, especially if a few months have gone by. Wrap parts in bubble wrap, toweling, or any other type of cushion to keep parts from damaging each other or the inner surface of the box. Do not rely solely on styrofoam peanuts as parts my migrate during carriage. After parts are individually wrapped bed them in your box filler material. Crumpled paper will work for light weight parts but bubble wrap, styrofoam, or foam cushion work better. Try to keep parts from directly touching sides, top, or bottom of your box, especially the bottom. Picture your box being dropped flat onto the ground and plan accordingly. If fragile parts, like porcelain faucet handles, can be removed and wrapped separately, do so. Due diligence is important. Bare in mind though that most reviews and ratings are in fact complaints. Few make the effort to praise. I receive shipped packages from every shipper. Anecdotally my worst experience is with USPS and my best experience is with FedEx. I must say this though in all fairness. Many problems resulting in lost and damaged goods originate with the sender, which is my primary impetus for writing this page. In any case, take the time peruse the online suggestions of your shipper. A few key words will get you there. For instance, "preparing packages ups" will generate fair search results. As will "preparing packages usps". I ship via my FedEx account. When I set up a shipment I include the email of the recipient and instruct FedEx to send notifications of both the initial shipment and the estimated delivery info. Those notifications include the tracking info. With most of the packages I receive I get no notification, though I have been emailing the client and tracking services are available through the shipping company. Providing tracking information, especially estimated delivery time, can be very useful. Luckily my door is well removed from the street.